Futurama uses its last episode, "Meanwhile," wisely. It fixes something that has bothered me from the beginning of the show, and shows us the beauty of true love. I love Futurama. I hope my time recapping it has made that clear. But, for me, there has been one unfixable problem with the show: it centered around Fry and Leela's ever-so-slowly budding relationship. They were the people whose relationship changed most over the years, and they never, not even for a second, worked for me. It seemed that, from the start, they were destined to be together simply because Fry wanted them to be together, and for no other reason. The attempts to reconcile fans to the couple only made it worse for me. When Fry made a deal with the Robot Devil to gain musical ability to impress Leela, it only served to underline the fact that they weren't suited for each other. He had to change radically to be of the slightest interest to her — and even then she was interested in a gimmick and not his personality. The episodes that pointed out how much Fry adored Leela also made it worse. Two people who tolerate each other can get along okay for a long time. But one person only mildly in like and one person desperately in love? That's a recipe for disaster. This final episode has, at last, made me want to accept Fry and Leela as a couple, and it got me there while being entertaining. The Professor invents a Time Button, which moves the whole universe back in time 10 seconds — with only the people in a "time shelter" protected — then takes 10 seconds to recharge to the point where it can be pushed again. 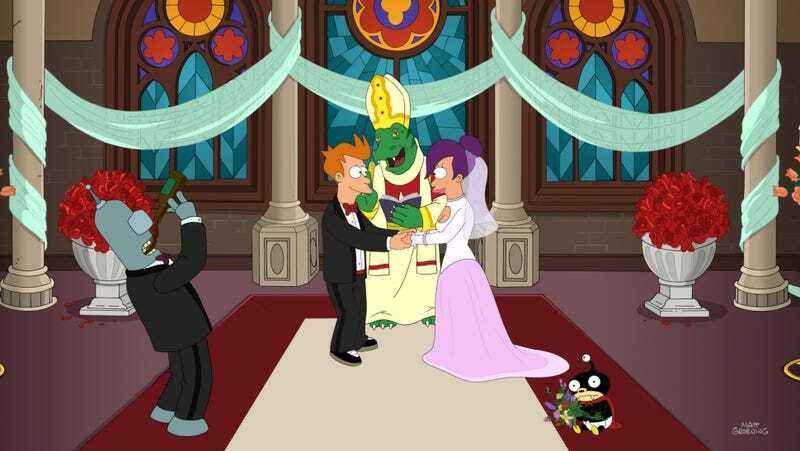 When Fry proposes to Leela, he uses the Time Button to make each moment of the proposal perfect, correcting any mistakes. He says that if she accepts, she should meet him on top of the Vampire State Building at 6:30. At 7:00, by his watch, he's still alone. He throws himself off the building, only to discover on his way down that because he kept pressing the Time Button his watch was ahead by half an hour. He presses the Time Button again, only to get stuck at the beginning of the fall. Since it takes him back in time 10 seconds, and takes 10 seconds to recharge, he can never free himself. What follows is a gruesome sequence in which Fry is trapped at various stages of the fall while Leela has to experience seeing him fall to his death again and again, until the Planet Express Crew comes to help. Unfortunately, Fry's final fall — the one that allows them to save his life — breaks the Time Button. The entire universe freezes. In the Twilight Zone, a frozen universe becomes the character's personal hell. In this Futurama, a frozen universe is okay with the right company. Fry and Leela pluck food out of the hands of frozen people. They walk across the oceans. They travel and see the marvels of a completely motionless world, and they have happy lives. At last, after years of whining and scorn, and then years of bickering and misunderstandings, Fry and Leela have an epic romance that proves that they really can make each other happy. When the show itself hits the reset button, it gave me the impression of a continuing adventure, which is exactly what this show should do. Happy trails, Futurama. I'll miss you.